Browse Artists and Groups Arthur Lismer, C.C., LL.D., R.C.A., O.S.A. Arthur Lismer was a world-renowned authority on children's art as well as a great teacher. He was a superb and very original artist and had been one of the founding members of Canada's foremost art movement, the Group of Seven. Dr. Lismer's office was at the Art Centre of the Montreal Museum, where he was the director of the school of art. There, I visited him frequently, particularly after his summer vacations in a cottage by an isolated beach on Vancouver Island, probably near Lismer Bay, named after him. He never revealed the exact location so as to ensure his privacy. I was a frequent caller at his office in the museum. He brought to his office there some of his most recent work, sometimes also quite large canvases, which he had painted from his sketches either during the summer on rainy days or even at home after his return. Although he took art very seriously, he only joked and belittled his own work. If a mother of one of his pupils admired something, he would say: "there must be something wrong with your eyesight but if you really like it, take it." Whether they really liked it or not, most people took it, knowing about Lismer's fame, then they often brought it to my gallery to ask what I thought of it and left the sketch or drawing for framing. It was never easy to buy any work from Arthur Lismer. He sometimes expressed the opinion that since he does not have to make his living by painting, he did not want to compete with artists who did and were having a hard time. Nevertheless, when I succeeded in putting a group of paintings together, I had to ask him the price. This was always difficult to determine and he often asked me to take the paintings and he would let me know within a few days. As I could not do anything with the paintings until I had prices, I was anxious to know, and when I did not hear from Dr. Lismer for a week I telephoned. He would usually ask me what I had taken, he could not recall I had taken any. I found that sometimes so implausible, I would wonder if he was putting on a bit of an act. Finally, I had to come over to his office once more, he would name the price, always quite modest and that was the end of it until next time. A good friend of mine and art collector also got to know Dr. Lismer well and had bought some paintings in his office. He always wanted to visit Dr. Lismer at home, partly, no doubt, to see what he had there. I told him that I had never been invited there and had never known anyone who had visited the Lismers. They had both been born in England and their home was their castle. They wanted no intrusion. My friend, a business executive who had been calling Dr. Lismer "Arthur" for a long time, once rang his bell on Fort Street. Dr. Lismer answered the door, stood in the doorway, said a few words and shut the door. The message was clear. The large early canvas, Cathedral Mountain, had been in storage at the Montreal Museum of Fine Arts for over twenty years. It was too big for him to store in his own basement and he had no other place for it. On one of his periodic visits with Lismer, my Toronto colleague, Blair Laing, bought the canvas and had it shipped to Toronto. Not many months after, the Montreal Museum purchased the picture. Dr. Lismer was pleased but surprised. He told me that had anyone from the Museum expressed interest in owning the picture, he would have gladly given it as a gift. 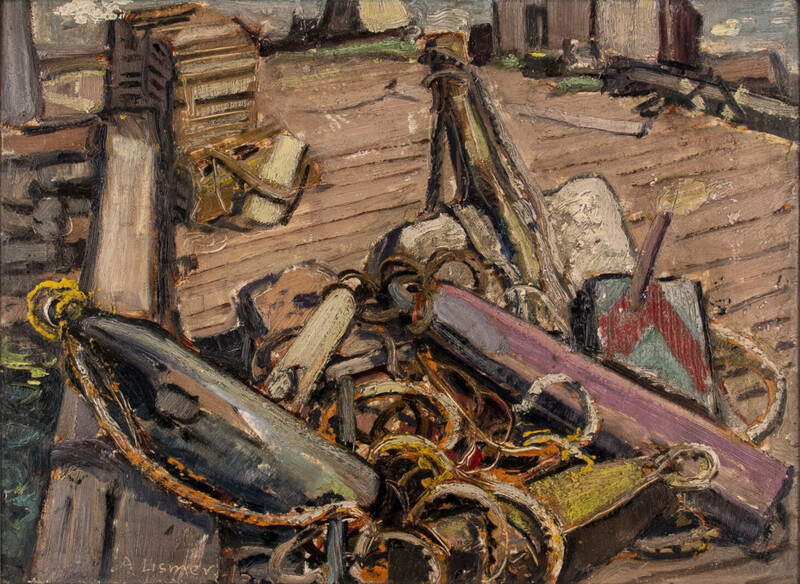 When Lismer died, things were removed from a storage room in the basement, including some furniture, which had been there for 25 years, ever since the Lismers arrived in Montreal from Toronto. In one of the chests a number of marvelous early sketches were found and also a superb Tom Thomson. To my surprise and relief, his widow had been left quite comfortably well off. The Lismers had always lived frugally, they never owned a car, he had always worked and painted and even though totally disinterested in money, his widow was left financially secure. The newly discovered sketches, many drawings and the Thomson were given to us for sale. The proceeds of the sale of the Thomson were to be given to the Montreal Museum of Fine Arts for the establishment of a Lismer Scholarship. This was an act of matchless generosity. Unfortunately, the Art Centre was discontinued soon after Lismer's death and I have never heard of the Lismer Scholarship having been awarded. The funds were probably put in one of the general or acquisition funds. Even so, Lismer, by his work established his own monument and can never be forgotten. Source: "Reminiscences of an Art Dealer", Walter H. Klinkhoff, Private Publication, Limited Edition,1993. © Copyright Galerie Walter Klinkhoff Inc.
One of the greatest pleasures of my career as an art dealer is the opportunity to meet people of the quality of Arthur Lismer. I first met Dr. Lismer in 1950, when much of his career lay behind him. Although our relationship remained professional (Lismer kept his private life very private indeed), we met often. Dr. Lismer's office at the Montreal Museum of Fine Arts was only a short walk from my gallery. I found him delightful - kind and generous, with a warm and spontaneous sense of humour. Lismer's work had always attracted me, and a personal acquaintance with him deepened my understanding and appreciation of his work. There is a prevalent critical tendency to regard the early work of many artists as their best. This attitude persists in spite of the fact that history is full of artists who reached their creative peak late in life. (Titian, for example, painted great masterpieces in his late eighties!) Those who identify Lismer solely as a member of the Group of Seven tend to view his later work, which departs from the popular and easily recognizable "Group" style, as evidence of deterioration rather than a positive artistic development. For many years Lismer painted Group of Seven subjects - islands, hills, lakes and forests, usually viewed from a distance - rendered in his own distinctive style. By the time the Group disbanded he had tired of these and turned to new images and themes. While continuing to draw his inspiration from nature, Lismer moved closer to his subjects. Painting from this new, more intimate perspective made a significant stylistic difference: his work now had a definite abstract quality to it without actually being generically abstract. It is this aspect of his later work which has been misunderstood and unjustly maligned. To change one's style and outlook late in life is an act of personal courage and imagination: the later work of Arthur Lismer deserves reappraisal. Always joking, invariably kind and courteous, Lismer never said anything critical about another human being, especially another artist. One of those people who always do more for you than you can do for them, his generosity was constantly in evidence. Parents of his students would often find a work of Lismer's that they had admired handed to them casually as a gift. They would bring it to my gallery, pleased but somewhat unaware of the value of the gift and the generosity of the giver. It is perhaps unnecessary to assert Lismer's importance in the history of Canadian art. As a founding member of the Group of Seven and as the creator or paintings that constitute a significant and lasting contribution to our culture, his status is secure. In his long career as a teacher he inspired two generations of students, leaving a lasting impression on all who were fortunate enough to come in contact with him. 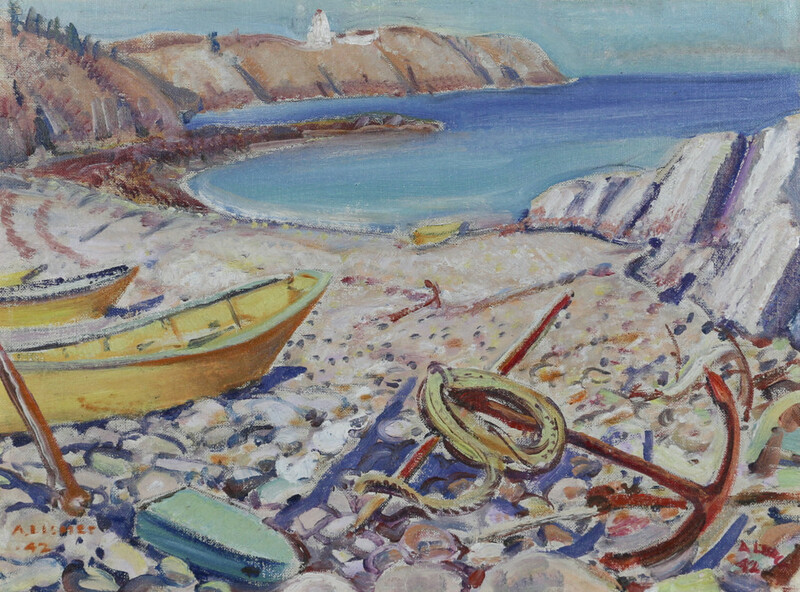 Arthur Lismer's name is held in the highest regard and his reputation, deservedly as great as that of any other Canadian artist, will continue to grow. Please send me more details about the following artist. Arthur Lismer, C.C., LL.D., R.C.A., O.S.A. signed, dated "A Lismer / 46." (recto, lower left). with two preliminary sketches contained in squares in pencil (verso, lower centre).